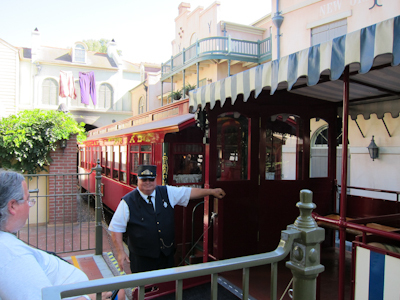 So I’ll admit it–I wasn’t taking notes during my Lilly Belle trip, but fortunately I emailed our conductor, Vern, and he very nicely pointed out that I got some of my facts wrong. Although, Walt had always wanted a private car for his railroad, it wasn’t realized until almost 10 years after his death. Then a man named Ken Kohler, the Roundhouse Superintendent, from 1961-1990, suggested that the observation car be revived as a Bicentennial Car. The Grand Canyon, car #106 didn’t see much light in storage, but was a great candidate for change. Eventually an idea was spawned that resulted into the building of this elegant private railcar as it is today. In July 1974, Ken was successful in convincing the powers-that-be into returning the car to the rails as a swank Presidential car as part of the park’s bicentennial celebrations. In 1975, the observation car, known as Grand Canyon, was refurbished and converted. Under the guidance of Retlaw Enterprises (Walt’s personal company, which still owned and operated the railroad at that time) Bill Cottrell and Lillian Bounds Disney, Walt’s widow and the car’s namesake, the canary yellow-and-green “Grand Canyon” received a meticulous, two-year-long makeover into the beautiful, burgundy “Lilly Belle” began. The car [was] to be used by Disneyland for Club 33 guests when visiting the park or hosting important guests. And as such, the kimono in the car was not a gift to Walt, who was already gone. Man, I just love learning all of these little facts and fun stuff, don’t you? Thanks Vern! Shelby! So glad to have found you! I’m totally going to pass this site on to friends who are Disneylanders. And Jude’s a train fan, so we’ll be checking out the Lilly Belle next time we head to the mouse! Gretchen! I still lurk over at your place :). Jude will LOVE the Lilly Belle! Be sure to try each time–it’s not always running but it never hurts to ask, even if you get there later in the day. Also, has Jude ridden in the tender seat? When it’s not scorchingly hot, they let one person set in the tender seat in the locomotive and be at the front of the train. You have to ask at the Main St. station but unless it’s cancelled for heat, there’s one rider each train so it shouldn’t be hard. I haven’t gotten a chance to do it since it’s apparently not kosher to just leave your 2yo strapped in his stroller munching on popcorn while you go ride Space Mountain or whatever. For newcomers, navigating by date or by land in the categories is an easy way to do it (there’s no organization to this blog, much like my life). I’ve also compiled a post of my popular entries, but the very most popular ones are the Search Engine Roundups in which I take all of the search terms that people use to find my blog and make snarky comments about them. That is *so cool* that you were able to get corrections and commentary straight from the horse’s mouth! !